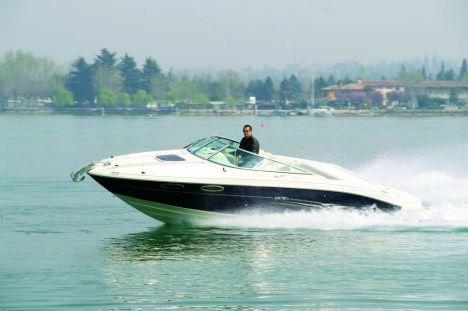 This Sun Sport version of the Sea Ray 240 is a sports boat par excellance and is totally different from the other "240" models as regards type of construction and design philosophy. The target clients of this model are those yacht buyers who, without giving up high speed, want comfortable accommodation for two. The outside of the 240 Sun Sport impresses for the imposing aft platform - a real bridge on the water - and for the cockpit, which seems to have been intentionally designed for suntan aficionados. 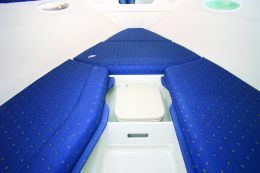 Most cockpit solutions were conceived with an eye to ergonomic design and specific applications: a supporting element positioned above the propeller serves as storage space for the outside dinette table and the aft sunbathing area covers the engine room pistons and makes good use of space. 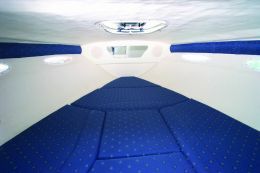 The cockpit is limited aft by the L-shaped settee and forward by the helm station, which includes two adjustable seats and the top-quality and fully fitted dashboard. Fore-and-aft passage is guaranteed by a walk-through in the central part of the windshield. 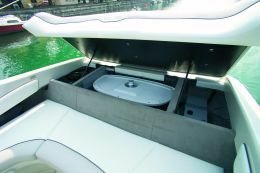 The bow area is finely finished with two flush rails, the central hatch and the anchor locker with mooring fittings concealed when not in use. Belowdecks, the 240 Sun Sport offers essential yet comfortable habitability for two: a V-shaped double bed with filler cushions, storage underneath it and a small central comfortable compartment with chemical toilet. 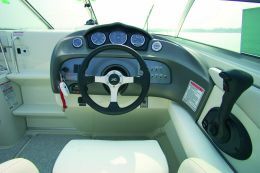 At sea, the 240 Sun Sport is a real sport boat with excellent maneuverability. The stern drive definitely plays a fundamental role in the boat's excellent performance and astonishing seakeeping abilities, in particular because it is combined with perfect balance of weights and a hull shape resulting from precise calculations and experience. 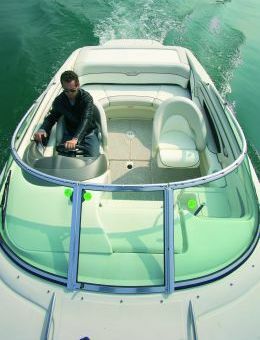 Price with standard fittings and test boat power: Euro 49,000.00 VAT excluded. No wind and calm waters. Minimum planing speed at 2,300 rpm's: 9.4 knots. Optional fittings: anchor windlass with two control stations.